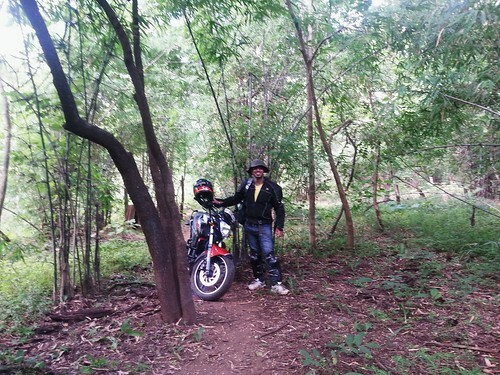 In Kawal Tiger Reserve…On Bike?? 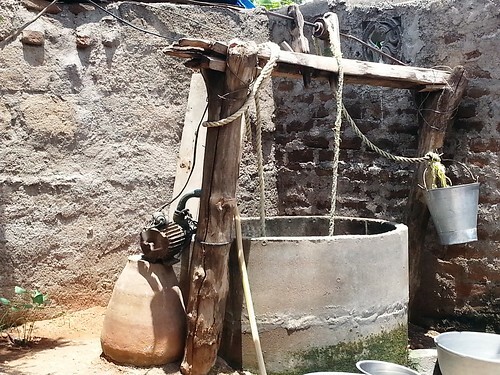 Recap: In the previous episode, you read about me taking some life lessons from a Guruji at Kala Ashram in Adilabad and saw some art works prepared in the Ashram using traditional methods. I was to leave for Kawal Tiger Reserve early morning. I woke up at 4.12 am to a chilly umm…night(?). 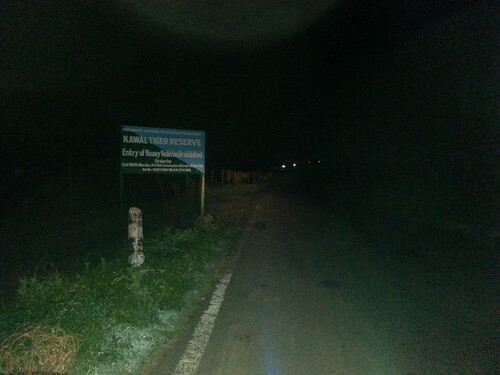 Dawn was faraway and that served my objective → Reach Kawal Tiger Reserve (90 Kms away) for early morning wildlife safari. Owing to my habit and necessity to be fresh before a ride, I forced myself to take a bath. Woo… it was cold! The ride was dark, cold and very much solo; I was singing aloud beneath my helmet to fight back the freaky silence. My speeds increased as the daylight started to show up. Imagine the sight of fog on the road giving way to your oncoming bike in the middle of a forest, it was surreal. Soon, I started revving harder to make up for my speed to cover the remaining distance in time, preparing my own recipe for a disaster – I crashed at a turn in the forest overlooking the signboard – Tiger Crossing Zone. This was serious business, but my riding gear had come to my rescue. I struggled but managed to get my bike back on the road, thanked my stars on hearing it roar back to life and continued. Never hurry – Lesson Learnt! I reached Jannaram and performed a quick check of the bike and found (almost) everything was luckily okay! 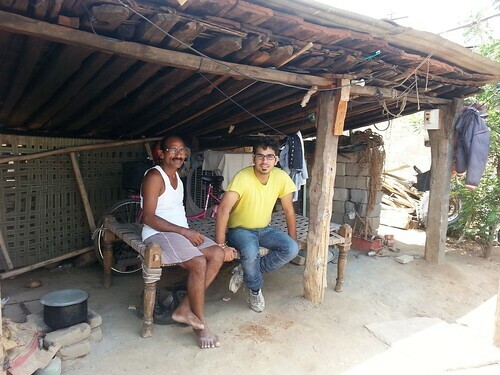 I had a quick breakfast by the time Shankar, my guide, came. I asked him how we were going for the safari, and he said: On your bike. And I went from okay to… What?! Shankar comforted me mentioning that he has been serving in the Reserve for almost 20 years now through an NGO devoted to combat Tiger poaching in the area. I was still skeptical but I started anyway, with him as a pillion. We might not even have properly entered the Reserve when the roads disappeared, all that remained was a trail left by the 4*4 Jeeps, Shankar’s experience and my wit. I was speechless and already a captive of the sight and everything that was around me – a bike cutting though a really deep forest on no trail suitable for riding to speak of, into more wilderness where unfamiliar sounds emanated from all the branches of all the trees and everywhere. 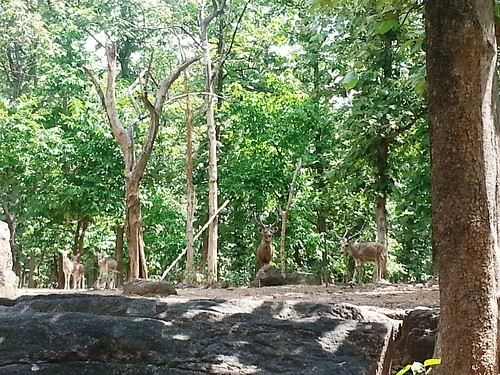 Shankar spotted some spotted deers early on in the ride behind some trees, bearing curious looks having spotted us! He was trying to spot more wildlife, but to me, the ride in itself was a wholesome adventure!! Finding it hard to manage on the wild trail, I offered Shankar to ride the bike, one of the very rarest occasions when that happens. A pillion on my own bike, I was catching amazing sights around and listening to Shankar speak about the Nilgai, Sambar deers, Chitals, Leopards, Wild Boars and Tigers in this Tiger Reserve, some of which I eventually spotted. A tiger, he mentioned was killed in 2012 when he took away a villager’s kid. Now, tigers are not there in the Kawal Reserve but there are some in the extended buffer zone of the Reserve. Once, we spotted a Chital running alongside us in a dried canal which almost instantly jumped in front of us to enter the forest on our left. Located in Jannaram Mandal of Adilabad distict, it is 250 kms from Hyderabad and the roads are awesome. Nearest railway station is Mancherial about 50 kms. Wildlife safaris (in jeeps) are available and accommodation is available in forest rest houses at Kawal. 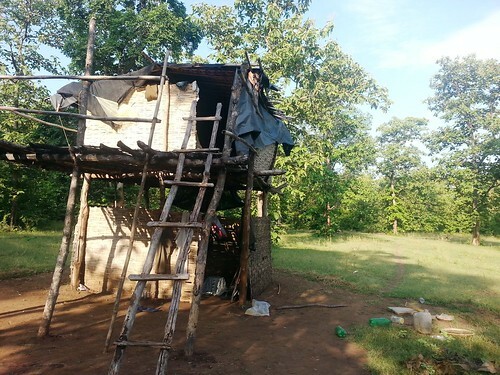 Other places of interest nearby are Pochera and Kuntala waterfalls, and Nirmal for it’s paintings. 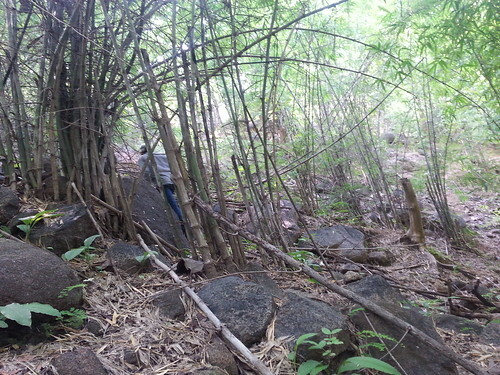 We parked the bike at a point, and went on our feet to find trails of some animals. Woah, it was amazing, all movie and Nat-Geo style! We (he) found some cane recently devoured by a wild boar, and spotted some feet marks as well. Sitting on a boulder in the forest and absorbing everything around first hand, outside the confines of a jeep was something very different! Then, I heard a loud growl and I looked at Shankar, the color of whose face had alrrady gone by then. He whispered and directed me to move. Realizing the intensity of the situation, no questions were needed. He whispered to me that a leopard was chasing a langoor for breakfast not very far from us and we should leave before things happen! Ohh… that much only I could manage to whisper. Everything was very logical, there was a system even in the wild. The carnivores predate upon the weaker ones. Mama animals teach their off springs to survive in the wild, but only till a point, beyond which Darwin’s survival of the fittest happens. Male animals go their ways to find food while females go in packs taking turns to watch out for predators. Alpha male decides what’s best for the pack and gets the best of the females. 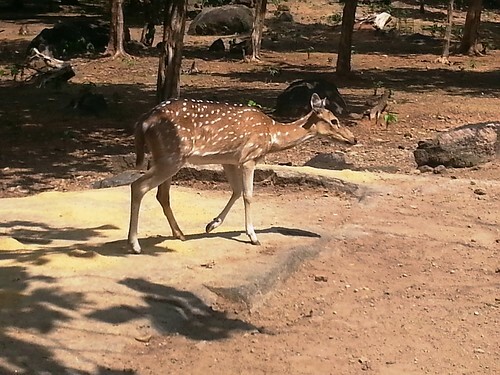 A forest offers open areas for the runners like deers to exercise but also isolated places to animals which would rather be egotist and too proud to cohabit with others. But in the end, everybody needs water and a pond is where they all turn up eventually one after the after! Much logical, you see. I lunched and rested at Shankar’s home whose family treated me with great affection. His son asked many questions about long distance riding. Much like Guruji the previous day, Shankar didn’t accept any money from me telling that Haripal ji, the Hindu correspondent, who arranged our meeting, was a close friend of his. 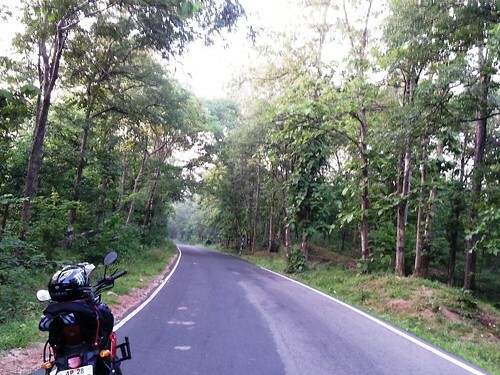 Ride back from Jannaram till Nirmal was no less scenic, it was a further 75 kms of forest dose. I was much more cautious this time but while concluding this 800 kms solo weekend ride, somewhere, more plans were already were being cooked. To travel with me, check my plans here. Beautifully written … loved the detailing 🙂 … Keep up the good work. Thanks Pamela. A lot thrilling it was…! Thanks. Yes, the roads are very good!! This is great post Jatin. 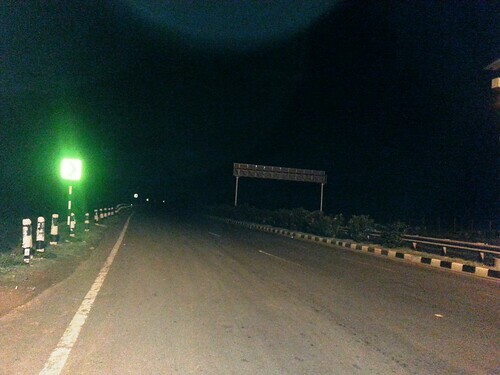 I can feel the excitement driving in night and wait to see the Tiger. 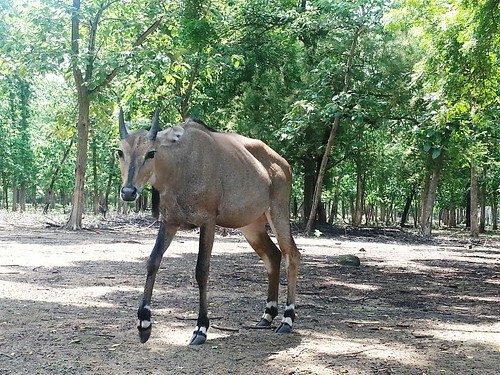 I have been to Sariska Tiger Reserve recently and I know how it feels to ride in Jungle. In my case, we found only Deers. What about you? What a trip! What a trip! I have done foot safari in South Africa and my guide had a loaded rifle! Of course there was no need to use it. But I know the feeling. My my! Foot safari in Africa?! That sounds awesome! The feeling is unmatchable! Wow. What an experience. I am jealous again. 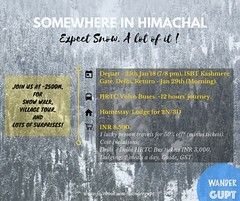 Your posts are awesome and do a great job at making me wanderlust for more, Keep them coming. Nice and amazing experience. We could not manage to visit Kawal but visited Nirmal though. Thank you! It was an amazing experience for me. Btw, how was Nirmal? Hello Jatin, I have dropped in here to thank you for reading my recent post. Hope you have read and not voted just like that. But what i found here is a wildlife lover and biker. It’s pleasing to know your passion. Haha, Yes, you got it right! Nobody rides my bike but me 😀 Hope you have a better luck next time. Thank you for dropping by. I was not really sure what I was in for when I started, but I was making sure to take only calculated risks. Thanks for the concern. 🙂 You are the first person to comment about the video, thank you, much appreciate it. True that, about the rules of the wild!